Decorating With Wall Letters from Bright Star Kids on Vimeo. Get Wall Letters with your child's name or favourite quote custom made from our removable wall decal vinyl, that easily sticks to most surfaces. It's an easy and affordable way to personalise a space that will look like it's been hand painted by a professional! Preview your wall letters before you buy in lots of different font styles, colours and sizes. Wall Letters are made from a removable vinyl, which will adhere to most smooth surfaces, such as plasterboard. Each word or phrase comes pre-spaced, with application tape, making it easy to apply to any wall, door or furniture. We recommend avoiding wash & wear types of paint that are designed to repel dirt, as this can also cause vinyl to not adhere correctly. We also do not recommend placing the vinyl on cement or concrete walls, as the bumpy surface can cause the letters to not adhere smoothly. If you would like to try a sample before you buy, please contact us. The Wall Letter name or quote will be scaled down to fit into panels that are 30cm/20cm/15cm/10cm/5cm high. The price will be calculated depending on the amount of characters typed in and the chosen size. We will aim to make sure that all the names or words in each order will be similar in height. This may mean that we need to scale down some names or words to make them work alongside the other names. Please Note: Wall Letters are made from a different material to our full colour fabric wall stickers range, so there will be a difference in finish and colour. Looks great and easy to apply! These Wall Letters are great! I had ordered my son's name for his bedroom door a few years ago and now just got one for my daughter. After 3 years, it has not come off at all, it's a great product and I love how easy it is to apply. I will definitely order again! I wasn't sure how this would look but they have exceeded my expectations, they really look great. I had advice from the team for what size to use as originally I thought the 5cm would be enough but am happy I changed and went with the 10cm. Great customer service and quality product. I customised my wall letter order to display my son's name on his bedroom door. They were easy to apply and I love that they are reusable so if we move they come with us! Brought 4 lots for kids names to put on Kayaks for Christmas presents, they look awesome. I ordered my baby girls name to decorate the wall in her nursery and I was super impressed with the quality. The letters were really easy to apply to the wall and when I realised I had put them up crooked it was simple to remove them and reposition without any damage to the wall. Thanks for a great product! I love these wall letters & have ordered several for all sorts of projects. Very easy to use & excellent quality. Absolute love them I ordered 4 different names for each of my kids and they look so good being the highlight feature on their bedroom walls! Perfect and easy to use. Has pride of place on my sons door. My niece and nephew love having their names above their beds. Such a simple thing that lets them feel they have their own special space. Easy to apply, good quality. I chose 15cm and they are a good size to label their room door. Love that it is so easy to apply! I purchased them for each of my children for their bedroom doors. Months later and I still love them every time I walk by their rooms. They are excellent quality, easy to apply, and very affordable. Love how they look, just a little too big for my doors. Should've measured first, but they will come in handy for something else. Fantastic quality and very affordable! Very impressed with the quality of labels for the price you pay. The adhesive is super strong but still delicate enough that it doesn't damage surfaces. Easy to install and they look fantastic. Highly recommend! I have to say a huge thank you for my customised Lettering. I wanted "Sometimes Miracles come in pairs" for my twins room but was wary about ordering as i've had issue in the past with another company. Chris from your customer service answered my email query in 15min and was so helpful in placing my order and ensuring my lettering all match size wise etc. I can't thank you enough, the lettering is perfect! This was my second order from Bright Star Kids and won't be my last and i will definitely recommend you to all my friends and family! We ordered 'play' to put on our toy room wall with some gold stars. Very happy with product quality. Is easy to put up and love that it can be moved without taking paint off walls. Very happy with these stickers. They look great. I moved them around a few times & they still stick really well. Easy to put up & look great. These letters are absolutely perfect and great quality materials. I used them to make up frames of my nephews' names as gifts and they turned out great! I've tried lots of adhesive wall stickers/decals from other companies - these are the best. It looks amazing above my little mans cot! Love these ... I stuck his name letters on a large mirror in my nursery room that doubles as a guest room at times, these white letters along with white clouds stuck all over this mirror gave me just the look I was after, love them SO much, looks like wall art but is also still a mirror. I've bought many an item from bright star kids. I've never been disappointed. I purchased the jumbo letters for my eldest daughters room and they look amazing. When daughter number 2 came along I moved the letters to my eldests new bedroom and I had no trouble getting them off and re-sticking them. I have also purchased them for my youngest and they're perfect! I had a sticker made with my daughter's name - I love it. It looks fantastic and was easy to adhere to the wall. Prompt & fast service & delivery. We purchased my daughter's inspirational motto 'NEVER GIVE UP'. It looks awesome above the mirror in her bedroom and it was super easy to apply. Any child's room would want one of these as they love decorating it aside from you. Great for all types of ages. Ordered some letters for my boy's bedroom, they look fantastic, stick great and were delivered in record time! We have these on the bedroom doors for our kids - they love that their name is on their door (and its great for learning to write too!). We are preparing to move house after 2 years in which i have had my daughters name in stickers on the wall of her bedroom. The stickers came down easily and didnt leave a single mark! We rent so we were very pleased! Love our baby girls wall letters. Really finishes off her nursery and saved me painting her name on! I am very happy with the two room stickers we bought for our kids doors, my only query was the slight size difference between them even though we picked the same size. This occurred because one name had a lower case 'g' and the other room didn't. My sons name is above his bed and he loves to point to each letter in his name. I've just ordered some for his baby brother so he can learn those letters now too! My son changed rooms when his baby brother was born and his name moved easily with him! These labels look so cute in our playroom - my little boy loves them and I love that they make us organised. Great idea to personalise your kids rooms without damaging the walls. These stickers have been a priceless addition to our home, as we are renting and cannot damage the walls etc. Looking forward to my next purchase. I have just got these letters to go on my son's bedroom doors and they look great and they love them. Even better if we ever move they can come with us. Saves holes and hooks! These wall letters are a great product! Good quality, easy to use and love that you can choose size, colour, font etc! I have twins and have their names above their own cots! Love!! Thanks BSK! Thank you so much! Easy to apply (and move) and they look super cute. My daughter loves her name on the wall... We read and spell it out after every nappy change! Great on the kids toyboxes. They now know which one is which. These wall stickers have been the best I have ever used! Great colours and different sizes to choose from, and I can get whatever name printed. As my kids are allergic to certain plastics in wall stickers, the wall stickers we bought have given them NO reaction what so ever! Thanks again, the kids love them and we can change their bedrooms around as often as we like. Thank you, these wall stickers look fantastic on my Son's wall, they really brought together the whole theme of the room. They were also easy to apply and great quality, not to mention speedy delivery and excellent customer service! Thanks so much. Thank you Thank you Thank you. I absolutley love this product. It looks amazing on Kobi's door. It was so easy to put on and delivery was super fast. I will be purchasing some more of these for sure. Thanks heaps for a great product! Their name 'Up in lights' !! It's so lovely to see your child's name 'Up in lights' so to speak, and they love it too! It also combines really well with removable wall stickers. Keep their name, but change the stickers when you want a new look. Fabo! I used the wall letter from Bright Star Kids to spell out my boys names on their bedroom wall. They were so easy to apply and the bright colours really stand out and maeke their room fun. We have my son's name up on his wall in his nursery as well as the star stickers! We put them all over the house and he loves looking at them and smiles at them all the time! We have many visitors comment on the name sticker and have even started buying these as gifts for friends who have little ones too! :) Wonderful product! We have BSK Wall Letters in the kids bedrooms. Not only do they look great the kids love seeing their own names on their wall. They are easy to apply, remove, reuse and look fabulous in any decor! Fantastic, my girls love seeing their names on the wall above their beds, a great way to brighten up the room too. I have used these wall letters to put my children's names on their own bedroom door and then put other stickers around them to personalise them. Kids love them and all visitors comment on them. these have been moved 3 or 4 times.. so easy to get on and off! and they add such a personal touch to any room.. ( especially bub's room ) ! I have my kids names up in their rooms and it was a very easy way to teach them to recognise and say their names. What are the sizes and prices of Wall Letters? The price will be calculated based on the number of characters you enter along with the size of the font chosen. You can choose from 5 different size letters – 30cm/11", 20cm/8", 15cm/6", 10cm/4" & Small 5cm/2". You can view more details on pricing in the Size & Price Guide in the main description tab. What length will my Wall Letters be? The length of your Wall Letters will all depend on the font chosen, the selected height size and characters entered. Please get in touch with our friendly customer service team if you need the Wall Letters to fit into a restricted space. How do I apply the Wall Letters? They come pre-spaced with transfer tape, which makes it quick and easy to apply to most smooth surfaces, ideal to use on painted plasterboard walls, smooth furniture or doors. You can watch a video tutorial on this product page to see how easy it is to apply Wall Letters. What surface can the Wall Letters be used on? Wall Letters are made from a different material to our full colour fabric Wall Stickers, and will only work on smooth surfaces, such as plasterboard, glass and furniture. We recommend avoiding wash & wear types of paint that are designed to repel dirt, as this can also cause vinyl to not adhere correctly. We also do not recommend placing the vinyl on cement or concrete walls, as the bumpy surface can cause the letters to not adhere smoothly. 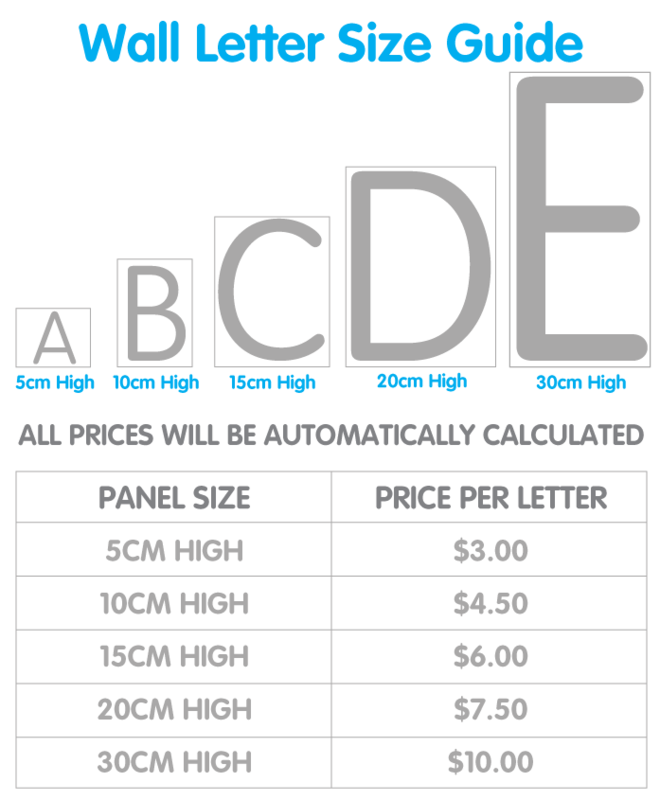 If you've ordered Wall Letters in the past, and would like to match the size of your current order to the last one, simply add a note in the Comments section of the checkout letting us know what you'd like and what your previous order number is. We'll be able to make sure your new Wall Letters match up perfectly in size & style to your previous batch. Can I remove Wall Letters? Yes as long as they've been applied to a well-prepared surface, you can easily remove them without damaging the surface.